Leon Charles Huber, also known as Leo was born on 11 January 1858 in Montmartre, Paris. He studied at the Ecole des Beaux Arts in Paris with Albert Pierre Dawant (1852-1923) and Jules-Alexandre Grün (1868 –1934). From 1887, he exhibited at the Society of French Artists and painted still life and animals, particularly cats. He won several awards and in 1903 received a mention at the Paris Salon. 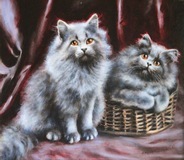 He started to specialise in superbly observed works depicting playful and mischievous cats. Huber became so well known for his paintings of cats that in 1908 a caricature was published of him as half cat, painting a cat portrait with his own long cat tail. His paintings remain highly popular today and can be found in many private collections across the world. The painting is housed in its original gilt frame which is in excellent condition.